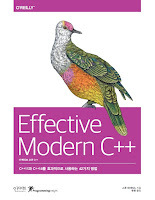 The View from Aristeia: Effective Modern C++ in Korean! I bought ec++ and mec++ several years ago and have bought this book also. The translator of this new book is famous in Korea for his efforts over translations especially for well-known programming books such as TAOCP, TC++PL, Generic programming and STL, series of Game Programming Gems, etc. I'm very glad to read your new book. Thank you for both of you and the translator to publish a valuable C++ book.